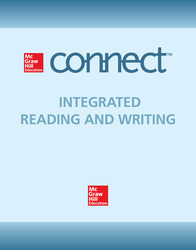 McGraw-Hill Connect is a subscription-based learning service accessible online through your personal computer or tablet. Choose this option if your instructor will require Connect to be used in the course. Your subscription to Connect includes: Access to your instructor's homework assignments, quizzes, syllabus, notes, reminders, and other important files for the course and progress dashboards that quickly show how you are performing on your assignments and tips for improvement. Recognize strategies that experienced readers apply at different phases of the reading process—pre-reading, during reading, and post-reading. Interpret charts, graphs and other visual aids. Use word parts to determine a word’s meaning. Use context clues to determine a word’s meaning. Use the features of textbooks and articles to improve comprehension and study skills. Recognize effective strategies for studying textbooks. Demonstrate understanding of vocabulary in the context of the reading selections in this topic. Identify prewriting strategies for generating ideas such as brainstorming, free writing, and clustering. Use a variety of prewriting strategies during the writing process. Use outlines and graphic organizers to plan and organize a piece of writing. Self-monitor writing progress to know when to return to the prewriting or drafting phases if necessary. Identify effective strategies and guidelines for conducting peer review. Apply peer review guidelines to offer appropriate peer review comments on a piece of writing. Analyze peer review feedback to determine a revision plan. Distinguish between revising and editing a piece of writing. Revise students’ own writing for meaning. Revise students’ own writing for style. Edit students’ own writing effectively. Identify the topic sentence in a paragraph. Write topic sentences for paragraphs. Determine whether a thesis is specific, clear, and supportable. Evaluate the strength of a thesis statement in students’ own writing. Revise a thesis statement to be more specific, clearer, or more supportable. Establish a specific, clear, supportable thesis in students’ own writing. Recognize common types of supporting details used by authors. Prioritize the supporting details in a paragraph. Prioritize the supporting details in an essay. Identify relationships between supporting details and main ideas in paragraphs. Identify relationships between supporting details and main ideas in essays. Analyze a paragraph to determine the adequacy and relevance of support provided for topic sentences. Analyze an essay to determine the adequacy and relevance of support provided for thesis statements. Analyze students’ own writing to determine the adequacy and relevance of support provided for topic sentences and thesis statements. Apply adequate supporting details in students’ own writing. Identify the ways a reader can respond to and interact with a text to increase comprehension. Mark, annotate, and take notes on a text to increase comprehension and prepare to write about it. Use outlining and a graphic organizer to organize a written response to a reading. Use outlining and use graphic organizers to study and comprehend textbooks and literary and expository texts. Distinguish between a summary and a paraphrase. Identify the components of a good summary. Summarize text information to demonstrate comprehension of a passage or an essay. Summarize portions of text sources appropriately in a response to a reading. Paraphrase portions of text sources appropriately in a response to a reading. Use quotations properly in a response to a reading. Identify examples of commonly used transitions. Evaluate the use of transitions in a text to move a reader from one point to another clearly and effectively. Revise a piece of writing to improve transitions. Use transitions appropriately in students’ own writing. Apply organizational structures in students’ own writing to develop a thesis logically. Analyze how the introduction and the concluding paragraphs establish a context for the thesis in a text. Craft appropriate introduction and conclusion paragraphs in students’ own writing. Outline the organizational structure of a piece of writing. Identify narrative writing and common transitions used with this method. Identify descriptive writing and common transitions used with this method. Identify definition in writing and common transitions used with this method. Identify exemplification in writing and common transitions used with this method. Identify division/classification in writing and common transitions used with this method. Identify process writing and common transitions used with this method. Identify comparison and contrast writing and common transitions used with this method. Identify cause and effect writing and common transitions used with this method. Identify argument writing and common transitions used with this method. Identify multiple methods of development within a single essay. Determine which patterns of development to use within a particular writing context. Apply a variety of patterns of development in students’ own writing. Demonstrate consideration and understanding of audience when reading/writing. Demonstrate consideration and understanding of purpose when reading/writing. Recognize appropriate tone for audience and purpose. Use an appropriate tone in students’ own writing. Apply an understanding of connotation and denotation to choose appropriate words for the writer's audience and purpose. Analyze how the author’s diction affects a piece of text. Analyze how diction affects students’ own writing. Identify examples of positive/neutral/negative connotations in a text. Apply understanding of connotation to word choices in students’ own writing. Recognize different types of figurative language. Use figurative language appropriately in students’ own writing. Use college-level vocabulary in students’ own writing. Identify reasons why authors imply meaning in their writing. Demonstrate the ability to imply meaning in students’ own writing. Define the structure of an argument. Recognize the thesis of an argument. Identify arguments that oppose an author’s thesis. Analyze the credibility, relevance, and adequacy of evidence presented to support the thesis of an argument. Distinguish visuals that convey information from visuals that express a point of view. Recognize point of view or author bias in a text. Analyze a students’ own argument through the lens of a reader. Critique an author’s argument in students’ own writing. Define summary, paraphrase, and quotations and their function in supporting the thesis of a text. Evaluate the strength and credibility of sources of evidence provided in a text. Evaluate the strength and credibility of evidence provided in students’ own writing. Evaluate the credibility and point of view of sources. Evaluate graphics and visuals for audience, purpose, credibility and message. Find evidence to support the arguments established in students’ own writing. Integrate evidence in the form of summary. Integrate evidence in the form of paraphrase. Integrate evidence in the form of quotes. Evaluate a piece of writing for appropriate documentation of evidence. Document and cite evidence appropriately using MLA style. Use appropriate methods of analyzing writing prompts. Apply study skills as necessary in the analysis of writing prompts. Use planning, time management, and the writing process strategically in responding to writing prompts. Recognize noun types and their functions. Recognize common pronoun types and their functions. Recognize common verb types and their functions. Recognize and identify adjectives and adverbs and the words they describe. Recognize and identify coordinating and subordinating conjunctions. Identify the different parts of speech in a paragraph. Differentiate verb form from verb tense. Differentiate regular verbs from irregular verbs. Identify and correct errors in both regular and irregular verb tense. Recognize shifts in verb tense and edit for correctness. Recognize the forms of irregular verbs to be, to have, and to do. Identify and correct errors in both regular and irregular verb form. Differentiate active from passive verbs. Recognize verb forms: infinitives, participles, gerunds and how they function in a sentence. Evaluate verb form and tense in paragraphs and edit for correctness. Evaluate verb form and tense in essays and edit for correctness. Identify the complete subject of a sentence. Identify the complete predicate of a sentence. Recognize the elements of a complete sentence. Differentiate an independent clause from a dependent clause. Evaluate a paragraph for complete sentences and edit for correctness. Recognize different sentence types: simple, compound, complex, compound-complex. Expand simple sentences with clauses and phrases. Form a compound sentence combining two equal ideas using coordinating conjunctions. Form a compound sentence combining two complete sentences using a semicolon. Combine sentences of parallel structure using coordination. Evaluate compound sentences in paragraphs for excessive coordination and edit for effectiveness. Evaluate compound sentences in essays for excessive coordination and edit for effectiveness. Form a complex sentence emphasizing one idea over the other using subordinating conjunctions. Evaluate complex sentences in paragraphs for excessive subordination and edit for effectiveness. Evaluate complex sentences in essays for excessive subordination and edit for effectiveness. Form a compound-complex sentence combining two or more simple sentences and one or more dependent clauses. Combine sentences to show comparison and contrast using coordination and subordination. Show the logical relationship between ideas in a sentence using a semicolon and a transitional word. Evaluate paragraphs for effective sentence combinations using coordination and subordination. Evaluate essays for effective sentence combinations using coordination and subordination. Recognize sentence fragments and edit for correctness. Recognize a run-on or a fused sentence and edit for correctness. Recognize comma splices and edit for correctness. Practice using the four common methods for correcting run-ons, fused sentences, or comma splices: a period and a capital letter; a comma and a joining word; semicolon, subordination. Edit paragraphs to eliminate fragments, run-ons, and comma splices. Edit essays to eliminate fragments, run-ons, and comma splices. Recognize and apply different word groups to vary the patterns of sentences in a paragraph: -ing word groups, -ed word groups. Recognize and apply different word series to vary the patterns of sentences in a paragraph: adjectives in a series, verbs in a series. Recognize and apply coordination and subordination to vary sentences. Differentiate active from passive voice and edit for active voice. Evaluate the sentence patterns in paragraphs and edit to vary for interest. Evaluate the sentence patterns in essays and edit to vary for interest. Determine whether the subject and verb in a sentence agree in number: singular subject = singular verb; plural subject = plural verb. Identify and correct errors in subject-verb agreement when the sentence contains a compound subject. Identify and correct errors in subject-verb agreement when the subject is a collective noun. Identify and correct errors in subject-verb agreement when the subject appears plural but is singular. Identify and correct errors in subject-verb agreement when the subject is joined with either/or, neither/nor. Identify and correct errors in subject-verb agreement when the subject is an indefinite pronoun. Identify and correct errors in subject-verb agreement when the subject is who, which, or that. Identify and correct errors in subject-verb agreement when the verb comes before the subject. Evaluate paragraphs for errors in subject-verb agreement and edit for correctness. Evaluate essays for errors in subject-verb agreement and edit for correctness. Identify pronouns and their antecedents. Identify and edit pronoun reference for accuracy. Recognize indefinite pronouns and their functions. Recognize and use correct pronoun case: as subjects, as objects, that show possession. Recognize shifts in pronoun points-of-view. Identify and correct pronoun confusion. Evaluate use of pronoun reference, agreement, and case in paragraphs and edit for correctness. Evaluate use of pronoun reference, agreement, and case in essays and edit for correctness. Identify and correct common errors in adjective and adverb use. Identify and correct errors in adjectives and adverbs that compare. Identify and correct common errors in the use of irregular forms of adjectives and adverbs. Recognize when to use well and good and bad and badly. Identify and correct errors when adjectives and adverbs are absolute words. Evaluate paragraphs for use of adjectives and adverbs and edit for correctness. Evaluate essays for use of adjectives and adverbs and edit for correctness. Differentiate misplaced modifiers from dangling modifiers. Evaluate paragraphs for misplaced modifiers and edit for correctness. Evaluate paragraphs for dangling modifiers and edit for correctness. Evaluate essays for misplaced modifiers and edit for correctness. Evaluate essays for dangling modifiers and edit for correctness. Differentiate parallelism from faulty parallelism. Identify and correct faulty parallelism in a series. Identify and correct faulty parallelism in headings, outlines and lists. Identify and correct faulty parallelism in comparisons. Evaluate paragraphs for faulty parallelism and edit for correctness. Evaluate essays for faulty parallelism and edit for correctness. Determine whether a sentence is making a statement, asking a direct question, or expressing a strong feeling and apply the appropriate end punctuation for each. Evaluate use of end punctuation in sentences or paragraphs and edit for overuse. Evaluate use of end punctuation in sentences or paragraphs and edit for correctness. Use a comma after introductory words. Differentiate essential from non-essential information and insert or remove commas as appropriate. Use commas to set off interrupting words. Use commas with parts of dates, addresses, titles, and numbers. Use commas to set off direct quotations. Recognize and eliminate unnecessary use of commas. Evaluate and edit paragraphs for comma use to add commas where appropriate and eliminate unnecessary commas. Evaluate and edit essays for comma use to add commas where appropriate and eliminate unnecessary commas. Recognize the main uses of apostrophes: to form contractions, to show ownership or possession, to make numbers and letters plural. Distinguish between contractions, possessive pronouns, and simple plurals. Evaluate apostrophe use in paragraphs and edit for correctness. Recognize the main uses of quotation marks: to set off direct quotations, to set off special phrases or words, to set around the titles of short works. Demonstrate knowledge of how to use quotation marks with other forms of punctuation: commas, semicolons, colons, and end punctuation. Differentiate a direct quotation from an indirect quotation and punctuate accordingly. Recognize when to use single quotation marks versus double quotation marks and punctuate accordingly. Evaluate a sentence or paragraph for special words or phrases that might require quotation marks. Evaluate the use of quotation marks in a paragraph and edit for correctness. Identify a colon in a sentence and recognize its function: to introduce a list, a long, direct quotation, or an explanation. Identify a colon in other contexts and recognize its function: to indicate a ratio and time of day, to separate a title and a subtitle, to separate a city and publisher in a bibliographic entry. Identify a semicolon in a sentence and recognize its function: to join two complete thoughts not already connected by a joining word or that includes a transitional word. Recognize lengthy items in a series that need to be separated by a semicolon. Evaluate a paragraph for use of colons and semicolons and edit for correctness. Evaluate an essay for use of colons and semicolons and edit for correctness. Identify parentheses in a sentence and recognize their function: to enclose extra information; to enclose numbers or letters in a list. Distinguish between the dash and the hyphen. Identify a dash in a sentence and recognize its function: to set off information within, at the beginning, and the end of a sentence for dramatic effect. Identify a hyphen in a sentence and recognize its function: to make a compound adjective placed before a noun; to spell out fractions and compound numbers; to join some prefixes and suffixes. Evaluate paragraphs for appropriate use of parentheses, dashes, and hyphens and eliminate those that are unnecessary. Evaluate an essay for or appropriate use of parentheses, dashes, and hyphens and eliminate those that are unnecessary. Apply the rules for capitalizing sentences. Apply the rules for capitalizing direct and indirect quotations. Apply the rules for capitalizing titles and subtitles from literature, music, film, television, magazines, and newspapers. Apply the rules for capitalizing articles, prepositions, and joining words in titles and subtitles. Apply the rules for capitalizing days of the week, months, and holidays. Apply the rules for capitalizing organizations, companies, and associations. Evaluate capitalization in a paragraph and edit for correctness. Evaluate capitalization in an essay and edit for correctness. Recognize the elements that must always be presented in numerical form: dates, times, addresses, percentages, exact sums of money, and parts of a book. Apply consistent presentation of numbers in a series. Recognize the most common situations in which the use of abbreviations in writing is acceptable: titles with proper names, time references, trade names or technical expressions. Evaluate the use of periods in abbreviations and edit for correctness. Evaluate the presentation of numbers and the use of abbreviations and edit for correctness. Apply the three basic rules for improving spelling: change y to i; drop the final silent e; double the final consonant. Recognize commonly confused words and use sentence context clues to decide on the correct word: homonyms; who, which, that; can, may. Identify and replace inappropriate language choices: slang, euphemisms, cliches, sexist and biased words, pretentious or inflated words, vague and abstract words, expletives. Differentiate denotation from connotation and recognize relationship to tone. Evaluate a paragraph or essay for wordiness and edit to make more concise. Evaluate a paragraph or essay for passive voice and edit to make more active. Evaluate a paragraph or essay for repetition and edit to eliminate it. Evaluate a paragraph or essay for omitted words and edit to fill these in. Evaluate the tone of a paragraph or essay and edit language for consistency and appropriateness. Evaluate paragraphs for appropriate grammar, punctuation, spelling, word choice, and mechanics and edit for correctness. Evaluate essays for appropriate grammar, punctuation, spelling, word choice, and mechanics and edit for correctness.